Black walnuts are interesting trees. They are among the last trees to leaf out in the spring and the first to drop their leaves in the fall. Frost brings leaves falling like rain. Walnuts begin falling in early September, a few at a time. By October many trees are bare of both walnuts and leaves. Other trees still have many walnuts hanging high overhead and lots of green leaves. Standing in the barn door during milking I listen to the walnuts hitting the metal roof on the workshop. Whump! Pow, pow pow. Thump! It is a continuous drumroll. Many of the black walnuts are still hard and green when they fall. The bigger ones will crush underfoot. The smaller ones roll and can make walking dangerous. Killing frost is a trigger for the walnuts to fall along with the leaves. Black walnut leaves are compound so there is a foot long stalk with nine leaflets on it. Each leaflet is close to two inches long and half as wide. Each puff of wind brought leaves swirling down from the trees. Sunlight highlighted these as they twisted and spun and fell looking like great green raindrops. Walnut leaves falling like rain covered the walnuts and ground as a green carpet. Walking is again hazardous. 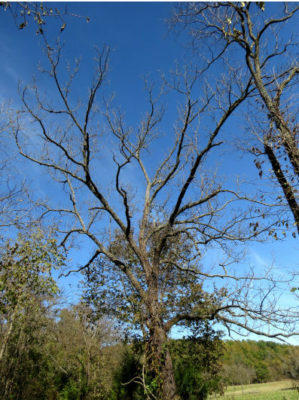 Black walnut trees don’t leaf out until the middle of spring. Their leaves begin to yellow and fall in the middle of August. The trees still grow big. I was done picking up walnuts. Two loads were plenty and took most of my work time for two weeks. Then killing frost paved the ground with more walnuts. There will be another load of walnuts. Not as big as the other two. It could easily be bigger. Walking out to find the goats in the evening the ground under every walnut tree was paved with walnuts and leaves. Out on the hills too there were leaves falling like rain. By noon the green rain was over. 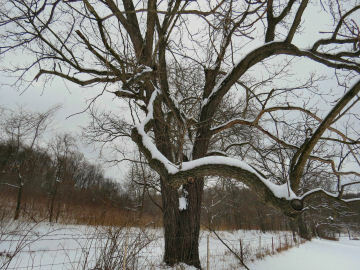 The black walnut trees are bare. It will be another year before I can again watch the leaves falling like rain. 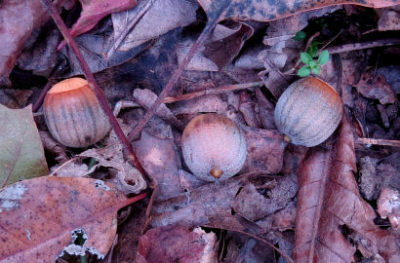 This entry was posted in Ozark Hills and tagged black walnuts, fall, Ozarks on October 24, 2018 by [email protected]. After living up near Lake Superior where winter arrived in October and stayed until April, the Ozark seasons had great appeal. All four seasons showed during the year, but none were extreme. Waist deep snow for six months would not be missed. In the North, the cold is dry. The air is sharp, bracing. Snow comes in many varieties. Each layer settles and is covered by the next. Sometimes ice even appears in clear air sparkling like diamonds drifting around. For those who have lived in snow country, the big impression from this picture is cold. Setting the shivers aside, snow makes a tree look so dramatic. Ozark cold is a damp cold. It slices through jackets dousing you in ice water. Snow and ice storms blow in, drop layers and blow elsewhere. Rarely does the ice or snow stay for more than a few days as warmer air arrives to turn them into mud. Temperatures creep up only to drop again with the next storm. Spring in the North arrives around the middle of April with the break up of river ice. It slowly spreads green across the landscape. Sudden, severe frosts can arrive even in June. Early spring leaves have a blue tinge in their green. The ephemeral plants shoot up quickly from stores of food in their roots. Other plants are slower to appear making the green carpet sketchy. Spring, my favorite of the Ozark seasons, doesn’t arrive in the Ozarks. It argues with winter for weeks. A single day can be wintry in the morning and spring in the afternoon or vice versa. These arguments can erupt into thunderstorms. Ozarks spring can be a few weeks long. The wildflowers appear. The trees leaf out. Or spring can seem only a few days long to be replaced with hot, summery days making the spring wildflowers trip over each other in their hurry to bloom and set seed. Northern summers don’t get very hot. Highs in the eighties are a heat wave. July is the prime time. August brings fall and night frosts again. Green is everywhere over an Ozarks summer. Over the summer the green changes shades and mellows until late summer green has a yellowish tinge to it. 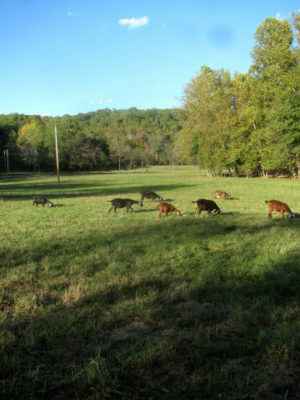 Summer in the Ozarks stretches from sometime in May to August. So much happens over an Ozarks summer, there seems to be little time to stop and admire the hills. The plants and animals charge ahead at full speed. Every plant is its own shade of green making the hills a collage of light to dark green mixed as though tossed for salad. Heat makes leaves droop. Humidity smothers plants and animals. Thunderstorms gather the humidity into towering clouds then drop it accompanied by pyrotechnics leaving the air so full of moisture animals almost need gills. Nothing announces fall in the Ozarks like the blazing crimson of the sumacs. It seems to glow. One day toward late August, it is fall. The day before was summer. Now the day has a cool fall feel, the night has a frost sharpness, although it doesn’t frost. 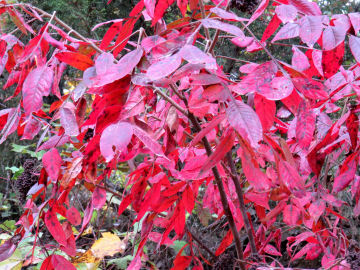 Sumacs blaze crimson. Virginia creeper and poison ivy hang red garlands from the trees and wrap their trunks with color. The year is winding down in a mad flurry of wildflowers and activity as birds migrate, raccoons and woodchucks fatten up for hibernation and storms change from puffy cumulus clouds to sheets of stratus clouds. One cycle of the Ozark seasons is over and winter comes again. This is an essay draft for the upcoming Ozarks book. Exploring the Ozark Hills explores the seasons through individual topics and is available now. This entry was posted in Ozark Hills and tagged fall, Ozarks, seasons of the year, spring, summer, winter on January 31, 2018 by [email protected]. Fall has arrived in the Ozarks. Between fall and the drought, leaves are turning and falling. Temperatures are cooling off. And the chickens have started their annual feather storm. Feathers wear out. They get damaged and ragged. So birds replace their old ones with new ones every fall. Chickens have lots of feathers. There are wing feathers. These are fun to make small quill pens out of. The big quills are from big birds. Wild turkeys drop these out on the Ozark hills. Once I even found a vulture wing feather. A chicken’s body is covered with feathers to keep their downy feathers dry. The down feathers look like a shaft of loose threads. Some hens never get real scruffy as the new feathers grow in before the old ones have dropped away. This hen has dropped many of her old ones and is still waiting for the new ones to grow in. Molting time arrives in the fall and the feather storm begins. The hen house looks like the chickens have had a pillow fight. The hens are scruffy. Everywhere the chickens go, the feather storm goes too. Along the chicken yard fence is paved with feathers. The milk room has pockets of feathers. No, I don’t really like the chickens in the milk room. But the tin roof faces west and heats the room up to hot unless I leave the door open. Feathers are made of protein so egg production has dropped. Some breeds stop laying now for the winter. I’m putting out more mice plus cheese to help supply more protein. Even extra milk helps. At three years old my old rooster is big. He now gleams under his new coat of feathers. His blue tail is starting to grow and will soon compliment his burnished bronze. Roosters don’t lay eggs. My three have dropped their old feathers and grown new ones already. Their tails are the last feathers to grow in. The old rooster has this spiffy new feather coat but no tail yet. The barred rooster has grown a single big feather so far. The arcana rooster never seems to have much of a tail. It’s the hens who are still waiting for their new finery. The new feathers are starting to grow. They look like ranks of dark needles sticking out over their backs. Once all the chickens have their new feathers, the feather storm will be over for this year. It will take longer to get rid of all the feathers blowing around. This entry was posted in High Reaches and tagged chickens, fall, feathers, molting, Ozarks on October 4, 2017 by [email protected]. Technically it is still fall here in the Ozarks. Weather wise it is fall flirting with winter and fall gardening season is in full swing. I used to end my gardening for the year with killing frost. Tomatoes, peppers, okra and squash including summer and winter squash and pumpkins were wiped out. All that was left to do was clear the dead stalks out, manure the garden and mulch over the weeds. One of my favorite crops is spinach. I would plant it in the spring, get a few leaves and watch it bolt. Spring got too hot too fast to grow good spinach. Fall spinach does much better. Spinach doesn’t mind some cold and frost. I was tempted. The long side of the raised be faces south so sunny days warms the bed up into summer temperatures. Two problems have surfaced with the plastic. One is securing the edges so rain runs off and doesn’t pool on top of the plants. The other is the wind. High winds will pull the plastic up even out from under the boards holding it in place. Then I build a raised bed. It is great for greens like lettuce and spinach. And it is rigged to put plastic over it for those really cold nights. Fall gardening became a possibility. My raised bed has been there for three years now. Each year I find out more about it. First I learned I needed to redo the stone walls around it. That was work but it is much more stable. Next I found the idea for the trellis/plastic arrangement in “Straw Bale Gardening” and put it up. I need to duct tape over where the wires join so the plastic quits getting caught there. The trellis is anchored by two tall T-posts. A wooden beam is between the tops of the posts. Wire is looped around the posts every six inches allowing the height of the plastic to be changed as plants get taller. On warmer sunny days the plastic is easily slid back for the spinach to get some bright light. The plastic can be left pushed back for rains when no freeze is coming before morning. Otherwise the raised bed needs watering once or twice a week. One problem I am still working on is how to keep the plastic in place when the wind decides to blow things away. Better plastic helps. Another is plugging up the holes between the stones so the dirt doesn’t wash away. Chickweed roots are doing the job this fall. Chickweed is a mild wild green good scrambled in eggs or tossed into stir fries. The first year I planted spinach in February and was eating it in March. Last winter the spinach grew slowly the entire winter. This is a better idea. So spinach is now a staple of fall gardening in my Ozark garden. It does take time but fresh spinach is worth a little time. 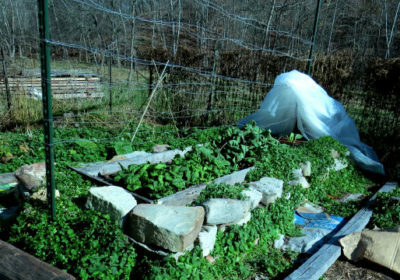 This entry was posted in High Reaches and tagged fall, gardening, Ozarks, raised garden bed, spinach on November 23, 2016 by [email protected]. I don’t do much birding. My preference is plants. But birds take center stage in the fall. Late spring and all summer trees are loaded with leaves. I hear birds in the trees or see them disappear into bushes as I walk around. Brief glimpses of disappearing feathers do not make bird identification or appreciation very easy. Plants don’t normally fly away. Open areas like the pastures and the bird feeder make birding appealing. Early in the morning the mourning doves line up on the black walnut branch or march across the to of the feeder waiting for breakfast to arrive. Indigo buntings and bluebirds show their flashes of blue. 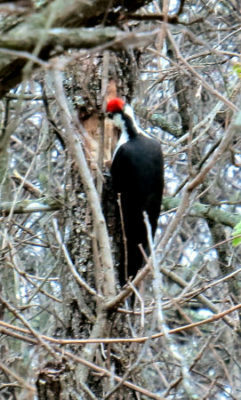 Pileated woodpeckers are the largest Ozark woodpecker. It is easily identified by the red topknot and loud call. It’s flight is typical woodpecker style rising with flapping wings then gliding down with wings closed only to rise again by flapping the wings. Later goldfinches add bright yellow to the mix. Wood thrushes fly up from the roads. But most birds stay hidden. Only their calls reveal their presence like the warbler that serenaded me from the apple tree then helped itself to apple snacks. Many of the leaves have fallen so trees are mostly bare now that late fall has arrived. Birds can’t hide so easily. Birding becomes an option for an amateur like me. Dead trees often start shedding their bark. Insects cluster there for winter protection providing woodpecker larder supplies. The juncos and chickadees have arrived for the winter. Cardinals look brilliant in their new red feathers. A real treat for me are the pileated woodpeckers. 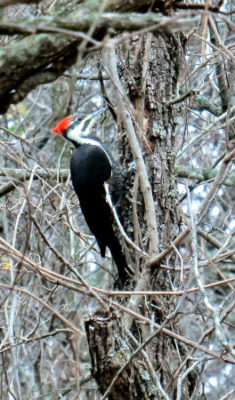 The woods has quite a few resident pileated woodpeckers but these birds are shy. Usually these birds are only spotted as they fly off across the pastures and up into the woods. Their calls announce their presence but stalking them is a waste of time. Now and then I get lucky. 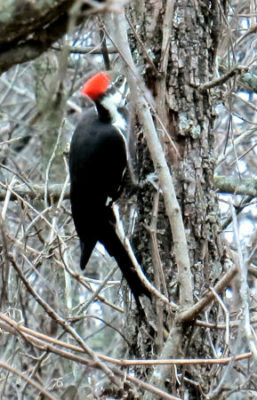 The white extends almost around the pileated woodpecker’s neck. It uses its beak to dig large holes in dead wood in search of the beetle grubs living there. One of the black walnuts along the road has died. It’s a smaller tree and the bark is starting to peel away from the trunk. A dead tree is an invitation to wood beetles to lay eggs. Beetle larvae are an invitation to various birds to come for dinner. Usually nuthatches, chickadees, red-bellied and downy woodpeckers answer the dinner bell. Today a young pileated woodpecker stopped by. The tree must have plenty of larvae to offer as this shy bird was still there after I went in for my camera. It worked diligently until a truck came down the road. Perhaps inside I am a birder as seeing one of these beautiful birds is a great thrill. But spring will replace birds with flowers once again. This entry was posted in Ozark Hills and tagged birding, fall, Ozarks, pileated woodpecker on November 9, 2016 by [email protected]. Killing frost is still to come here in the Ozarks. The plants are taking advantage of this for seed time. A few wildflowers are still blooming. Asters, dayflowers, the last goldenrods and dandelions brave the cold winds. Most plants have gone on to their most important task: making seeds. Many of these plants will die at killing frost. Only seeds will insure they will grow and bloom next year. Fall is seed time for all the late summer bloomers. It is interesting to go out and see them. Woodland goldenrod grows up in the woods. It isn’t as showy as old field or tall goldenrods but has the same seed pattern. 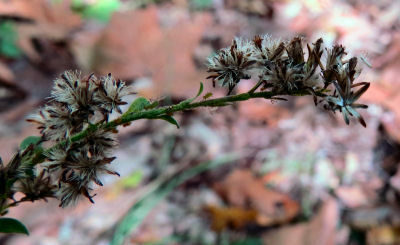 Each group of flowers becomes a group of tufted seeds. Goldenrod is fun. Each kind of goldenrod has its own shape. Their seeds have stiff brownish gray hairs sticking up. The shape is now fuzzy instead of gold. Goldfinches now mostly dressed in drab green and sparrows hang on the giant ragweed and chicory stalks wresting seeds out of their tubes. Other seeds like milkweeds drift by on any stiff breeze. One part of my botany project is to observe the seeds of the various plants. Fall seed time is a great time to see these seeds. 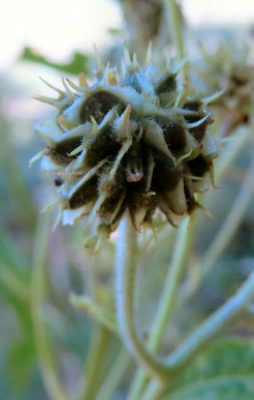 Yellow Ironweed seeds are tucked into little compartments. Wind will rattle a few loose. Most are eaten by goldfinches and other small birds. Some of the seeds are dropped off elsewhere. There is a problem. Many of the plants are dead, brown, dry stalks. They are not labeled with names. This year I walk by trying to remember which plants were growing where. Some have enough of the leaves left to give me clues. Others I make note of and will try again next year. Going walking now does have other advantages. Leaves are turning color. The insects are less numerous. The air is crisp with the taste of fall in it. 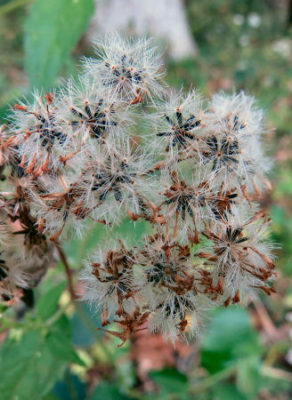 White Snakeroot seed bundles look like miniature dandelion tufts. These bits of fluff float off on stiff breezes looking like fall snow showers. Unfortunately the deer ticks are now out in force. In my area these are not as numerous as the lone star ticks of spring and summer. Still, they are a concern and warrant a good tick check after coming in. Winter is coming. Walking in winter is much colder with much less to see than taking advantage of fall seed time. This entry was posted in Ozark Hills and tagged fall, Ozarks, seeds on October 22, 2016 by [email protected]. Fall is closing in here in the Ozarks. The leaves are starting to change. Stickers are everywhere. Dogwoods, Virginia creeper, sumac and poison ivy are among the first plants to change. Reds predominate although the dogwoods are more purple. Elephant’s Foot, Spanish needle and ragweeds have finished blooming. Now they are covered with seeds all needing to hitch a ride to somewhere else to grow next year. These seeds aren’t like the beggar lice and ticks with their short hairs that stick and tangle in fur and hair. 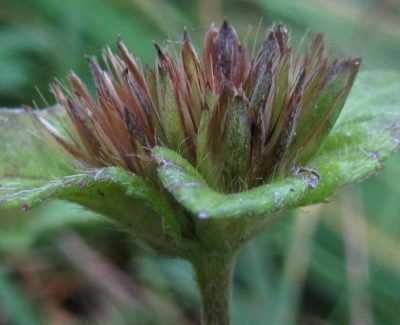 They aren’t like burdock covered with tiny hooks that catch passing pants legs. These seeds are stickers. They have long points that stab into fur, socks and pants. Once stuck in, they stay in. Sticker seeds are usually long, thin and sharp at the ends. The point sticks into fur or fabric. The short hairs or flared tip hold on pulling the seed loose to be carried off. Little by little these seeds work their way through the fur or socks until they stab flesh. This can be painful as the seeds have sharp points. Once the points start poking into an ankle, the nearest stump or large rock becomes a welcome refuge to sit on. The offending stickers are invariably down below the edge of the shoe requiring removal of the shoe. A quick scrape of the sock is not sufficient. Complete removal of the stickers takes care or a point will break off and be left behind. It will make its presence known as soon as the shoe is put back on. After removing these sources of stabbing pains, the shoe is pulled on again. The walk continues until the next round works its way in. Gilled mushrooms are difficult to identify but easy to admire. The gold top and patterns on the stalk make this one pretty. Is such a walk enjoyable? Certainly the stabbing is not. But the forced sitting gives time to look around, listen to the leaves and breeze interact, relax in the quiet of the woods. Most flowers are done blooming leaving the woods looking blank. The green still spreading across the forest floor is changing to yellow green. Now and then a surprise is there to stop the walker for a spell. Mushrooms are out. Corals, gilled, jelly, shelf mushrooms poke up through the leaf litter, coat fallen and upright dead trees. These pinesap flowers have finished blooming and are setting seed. 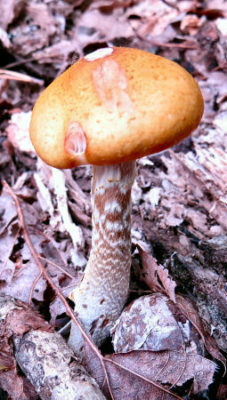 Pinesap is a saprophyte living underground on wooded Ozark hills sending up flowers in the fall. Another treat is spotting Indian Pipe or Pinesap. The stickers are a nuisance but worth the annoyance for a walk in the fall woods. 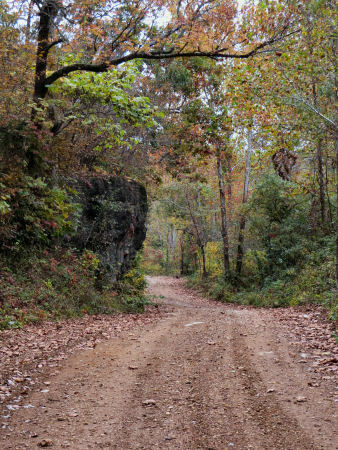 This entry was posted in Ozark Hills and tagged fall, hiking, Ozarks, seeds, woods on October 12, 2016 by [email protected]. All spring and summer I have been working on my insane botany project. I’ve been doing the fun part: taking pictures of the many wildflowers and plants. Once I have the pictures I try to identify the flowers. The many asters now in bloom are defeating me. Asters are among my very favorite flowers. They are the highlight of fall. First to appear are the white heath asters and Drummond’s asters. When I first saw these, I thought they were the same as they are much the same size and have whole bouquets of flowers surrounding their stalks. Along the edges of the woods and up into them I found this small aster. The plants look similar to white heath aster until you look closer. The flowers are blue. The leaves are different. The buds are different. 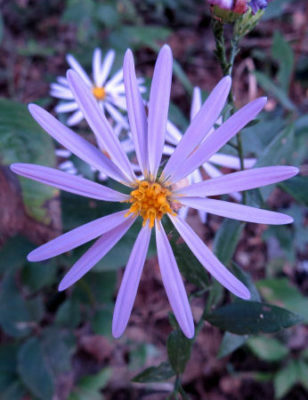 This is Drummond’s Aster. Upon closer look differences were obvious. White heath asters are just that: white. 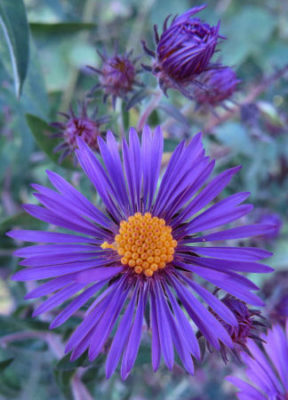 Drummond’s aster are bluish lavender. Their leaves are different. Where they grow is different. So this year I have been looking closely at the many asters blooming. A case in point are the blue asters along the road. I stopped and took pictures of a blue aster. It was the only one around at the time. Some of the pictures needed redoing so I stopped again at what I thought was the same place. I stopped for pictures of the spreading aster and found this one. The cup under the flower has lots of curly points whereas spreading aster is smooth. It’s rays are shorter and thicker. 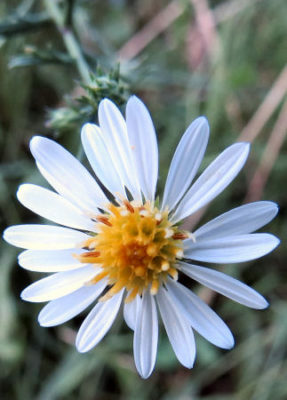 It is called Aster anomalus with no common name listed. The blue asters blooming there were not the one I had seen earlier. In the space of ten feet along the road I found three different blue asters! 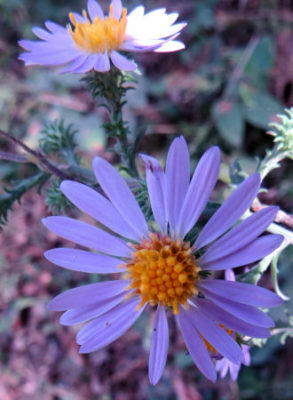 In identifying asters there are several important things to look at. One is the flower or collection on tube flowers and ray flowers referred to as the flower. The number and color of the tube flowers matters as does the number, color and shape of the rays. Spreading Aster is one of the blue to lavender asters. 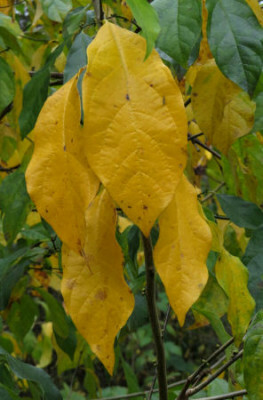 It’s leaves are distinctive making it easier to identify than many others. The rays are long and narrow but numerous. Behind the flower is a base. Some of these are smooth. Others have curly cues hanging off of them. The shape of the leaves, whether or not the leaves have petioles, if they are hairy or not all need noting. The same is done with the stems. This is a new aster to me. 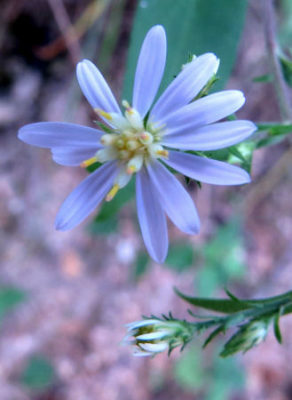 It has the long narrow rays like spreading aster but fewer of them. The leaves are different. It resides in my Unknown folder for now. Some asters have big leaves at the base of their stems. Most do not. Armed with pictures of all of these points I went home to identify the many asters I had found. First I opened the guide books. New England asters are easy to identify. 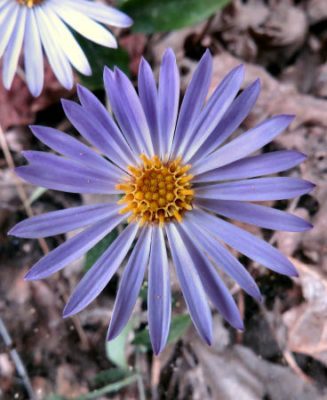 Their rich purple with gold centers is unlike any other aster. New England Asters line the roads with three to five foot plants covered with purple blooms with gold centers. The color is richest on plants in the sun. The blue asters listed in the guidebook didn’t help much. Out came the Flora of Missouri, Volume 2. This extensive volume lists 24 different asters not counting subspecies. Some don’t grow anywhere around my county. Seventeen do with four possibles. I did manage to identify one of the many asters I found with this book. I will work on the others again another day. Wildflowers will fill my winter months too from the number of flowers in my Unknown folder. This entry was posted in Ozark Hills and tagged asters, fall, New England Aster, Ozarks on October 5, 2016 by [email protected]. Fall is not my favorite time of year. Yes, the leaves are beautiful in their many hues. Yes, the cooler temperatures are a welcome respite from summer heat. Fall frost warns of cold moving in. For me fall makes it hard to enjoy walking in the woods. I love the green plants and colorful flowers. I love warm air and not wearing layers of clothing plus a coat. This gallium plant has its leaves edged in white frost lace. 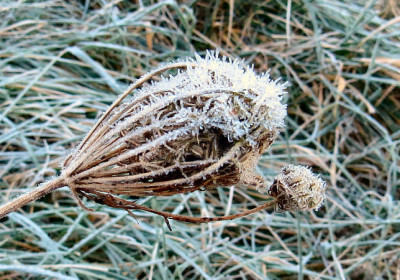 Frost means dead plants, bare trees and slippery paths covered with dead leaves. Definitely a time to sit inside near the wood stove. But frost has its attractions too. Killing frost has a special attraction. Each delicate lacy leaf lobe has its frost edging. Hard frost freezes the dew on anything. 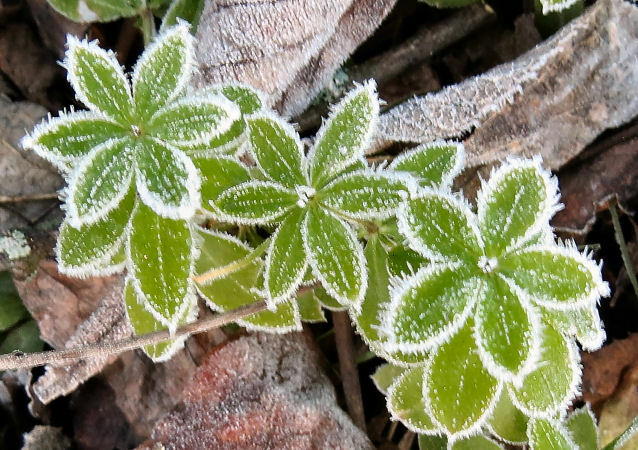 In freezing the dew becomes little spikes edging leaves and leaf veins. They form delicate traceries on plant stalks. Such frost pictures are common all winter. One isn’t. 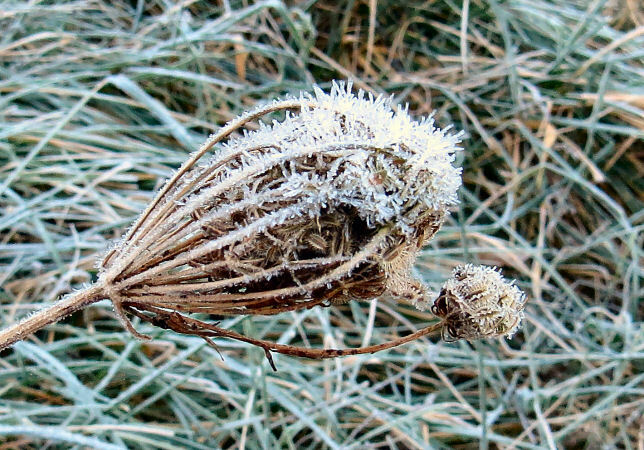 Ice spikes fuzz out from the beggar lice in this Queen Anne’s Lace seed head. The first real killing frost, the one down in the low to mid twenties, brings out the frost flowers. The wild mint dittany is a reliable plant to make frost flowers. White crownbeard does too but grows along the road where the sun shines early in the day. Dittany is up in the woods. Frost flowers last only a short time. The air must be cold. No hint of sun must touch these ice creations. No wind must go through to break their delicate ribbons. Dittany stems still have water in them when killing frost hits the Ozark hills. The water freezes splitting the stem allowing the ice to ooze out in an ice ribbon forming a frost flower. The temperature was twenty-five degrees at dawn. Perfect. Frost laid heavy on the ground so there was no wind. Perfect. The sun was peaking over the hill but still hidden behind the trees. The world was light enough to see easily. Perfect. The frost flowers were out in abundance on the hills. This entry was posted in Ozark Hills and tagged fall, frost, Frost flowers, killing frost, Ozarks on November 12, 2015 by [email protected]. Fall colors peaked here on my Ozark hills last week. Wind ruined much of the color but has resulted in fallen treasure for my garden. Driving to town this time of year I see so many people raking their leafy treasure into the roadside ditch and burning it. The smoke is annoying sometimes even blinding. It is a discouraged practice but tradition dies hard in the Ozarks. Sugar or hard maple leaves turn brilliant shades of red turning the tree into a blaze of glory. I might have joined this opinion that fallen leaves have no value except for reading a gardening book when I first contemplated growing a few tomato plants on my own. My father was an avid gardener all his life. He did the gardening. Helpers were relegated to pulling weeds. That teaches how to weed but not how to garden. Weeding did give me an appreciation of sitting out in the garden enjoying the weather, the quiet and the activity. That is why I found myself reading about gardening. Soon the red leaves turn to dry brown as all moisture evaporates from them. My rented house sat on fill dirt that was not fit to grow even grass let alone tomatoes.I dug this huge trench where the garden would go.My neighbors thought I had gone mad. They were glad to let me rake up and remove their maple leaves. Bag after bag of maple leaves landed in that trench until this foot deep hole was full to overflowing. Then the dirt went back in on top for the winter. The leaves may fall one at a time but they add up quickly into a carpet of brown with occasional bits of color all rustling in the wind. The next spring I bought small tomato plants and set them out. The neighbors all watched knowing these plants would wither and probably die in that terrible red clay and gravel fill dirt. The little plants grew bravely until they hit that buried treasure. My garden became a jungle of tomato plants semi-staked as I was learning how to do that as well. Pretty Boy is watching his stash of fallen leaves disappear into a pile. I love fresh tomatoes from the garden. Fresh tomatoes from my own garden were even better. But there is a limit. Tomatoes for breakfast, lunch and dinner is too much. The neighbors received sacks of tomatoes to supplement the few from their own well tended rich soil gardens. I even learned how to can that year. Strangely, when I went calling to gather leaves that fall, there weren’t many available. It seems the neighbors had learned about this fallen treasure too. Since then I’ve read and experimented with this fallen treasure. Oak leaves will work but are better composted first as they are thick and slow to break down. 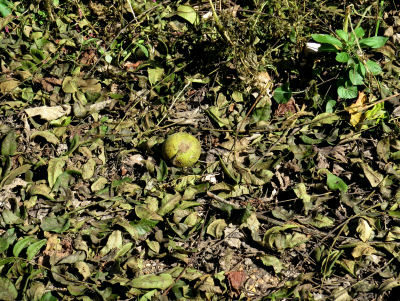 Black walnut leaves are not good in the garden as these trees produce juglan, a form of chemical warfare that prevents some plants from growing at all. The best treasure are maple and other thin leaves including elm, sweet gum and hickory without the twigs. These can be buried or spread out over the garden area. Running over them with a lawnmower to cut them into smaller pieces is good but not necessary. 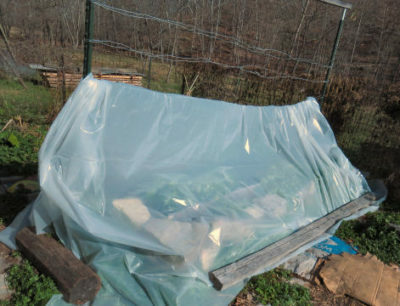 Leaves do dry out and blow so they need to be covered with mulch straw. In the spring these leaves have broken down into leaf mold, a wonderful organic loam relished by plants. For the gardener this is true buried treasure. This entry was posted in High Reaches and tagged fall, fallen leaves, garden, treasure on October 28, 2015 by [email protected]. Mention fall to most people and leaves changing into fall colors is what they think of. My part of the Ozarks is disappointing in that regard this year. Beautiful fall colors depend on several factors. One is day length and that happened right on schedule. An Ozark country road winds around a bluff rock and past a creek under leaves turning colors. Another is rain. Rain in the Ozarks stopped in September just when the leaves would stock up to put on their fall display. Temperature seems to matter too. Usually temperatures drop in early September and flirt with freezing for about a week. The cold spell did show up but wasn’t very cold. Sumac turns red early in the fall. The last factor is the wind. This has been a windy year especially lately. 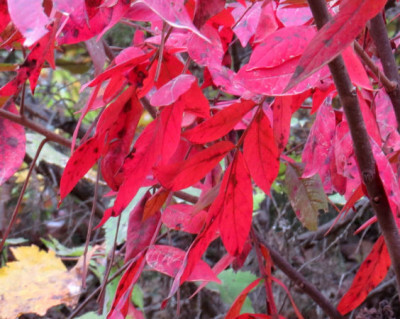 Fall colors show up when temperatures are too cold for chlorophyll. Most leaves start making a thick layer between their stalk or petiole and their branch about then. They start sending chlorophyll back into the branch or letting it decay in the leaf. Colored pigments can do photosynthesis at lower temperatures than chlorophyll so the leaf makes these. Green disappears. Reds, yellows, purples and oranges appear. It takes water to make these colors. That thick layer marks where a leaf will break free of its branch later on. It is a weak spot. Wind tears the layer loose early pulling the leaves off the trees. Spice bush turns bright yellow. This bush started but wind carried off its leaves before the entire bush turned yellow. October is usually the month when the Ozark hills are painted in fall colors. I was watching the far hill start turning. One morning the green on the hill becomes yellow green. The yellow increases until the hill is covered with yellow hickories and dusky red oaks. The yellow tinge began on schedule. The wind tore through. Instead of yellow and dusky red there is the dull gray of bare branches usually reserved for November with patches of fall colors trying to show off. Light frosts encourage leaves to turn color. There were no early frosts but plenty of wind so many leaves like this sycamore one are blown down still green. Many trees still have green leaves. Several frosty nights have confused matters even more. Light frosts will turn leaves into fall colors in a single night. There were no light frosts this year. 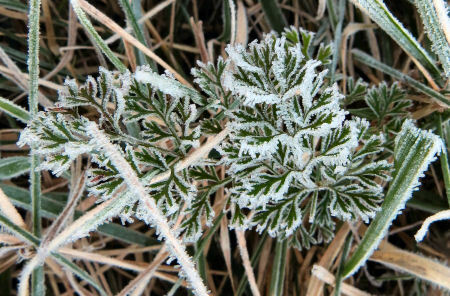 Instead temperatures dropped into the high twenties, a medium frost but not a killing frost. A killing frost at night is followed by a morning when the leaves drop like rain. A medium frost is followed by dead dry leaves of green or fall colors hanging from the trees until the wind tears them loose flinging them to the ground. Fall is the harbinger of winter, not a happy thought. Fall colors at least make this palatable. Maybe next year will be better. This entry was posted in Ozark Hills and tagged colors, fall, frost, October, Ozarks on October 21, 2015 by [email protected]. The goats are busy eating acorns and don’t come in on time some days. I went out looking. 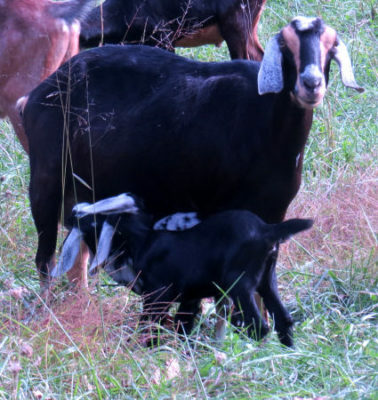 The goats make such a good excuse to go out walking. Acorn hunting for the goats takes them out of their normal haunts and up onto the hills where the oaks rule. So I went up the hills. Following a path up the hill I scanned the ground for evidence the goats had preceded me. The ground is dry and hard, too hard for hoof prints. Often Indian Pipe flowers come up in a cluster like this one pushing up through loose gravel on the side of a hill. Ahead of me six inch tall translucent white flowers stand up among the gravel bits of the path. Fall has its asters in shades of lavender and blue, its sunflowers in yellows and trees turning various fall shades. It also has some unusual flowers in white. Think of plants and you think of leaves, stems and flowers. Two flowers in the Ozarks are only flowers. These strange plants grow underground living as fungi do eating decaying fallen leaves. In fall their strange flowers appear from under the leaf litter. The colorful pinesap in orange and red does grow here but I’ve found it only a time or two. More common is the ghostly Indian Pipe. Careful looking finds other Indian Pipe flowers like this single flower among the leaf litter. The flower emerges with the pipe bowl facing down to the ground. As the flower ages, the pipe bowl rises until it finally points straight up when the flower is old and withering. Indian Pipes should be easy to spot because of their color. They aren’t. Somehow their color blends into the leaf litter that often mounds up along their stems. Even inside an Indian Pipe flower looks different. When I go looking for Indian Pipes, I look for mounded leaves then for the flowers. They are usually on hillsides near gullies so the ground has a bit of moisture in it. Once one clump is spotted, others are often in the same area. The goats would have trampled the delicate Indian Pipes so they didn’t go up that hill. I wandered off looking for flowers then picking pawpaws. Evidently the goats heard me as they were waiting at the gate when I came in laden with fruit. 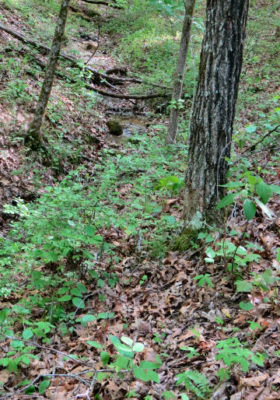 This entry was posted in Ozark Hills and tagged fall, Indian Pipes, Ozark woods on September 30, 2015 by [email protected].